Two patients share their experience with parotid tumor surgery at Osborne Head & Neck Institute. "I cannot state the degree to which these men and all at OHNI went to alleviate my suffering. It went beyond the norm of any medical experience I had in the past." 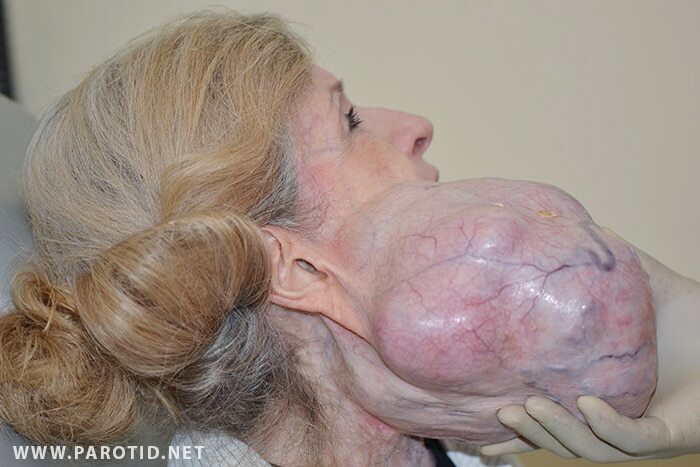 Salivary gland with mixed tumor (pleomorphic adenoma). 25cm x 27cm total parotidectomy specimen. My benign parotid gland tumor was a 31 year growth until my daughter found OHNI’s incredibly informative website, miraculously, it seemed to me. For I had years ago given up hope of finding a doctor to safely and without facial nerve damage, remove my increasingly grotesque looking and physically debilitating tumor. For almost 10 years prior to its removal, and with my inability to continue to hide it beneath my hair, I became housebound, which profoundly affected my quality of life. Fully knowing the history of my extensive yet unsuccessful search for a medical solution, my daughter, so impressed with the OHNI website, took the reins and scheduled a consultation with Dr.’s Osborne and Hamilton in NYC. She informed me after the fact. I was upset! She reminded me this was merely a consultation and that proceeding toward surgical removal was solely my decision. I agreed to go, but not without great trepidation. Those of us who know these doctors will also know how and why my fears dissipated by the time the consult ended. Noelia’s invaluable and ongoing assistance with even the minutest of details further afforded us the certainty we needed that we had chosen the right path. We scheduled my surgery for early Feb., 2012. That day, as we left the doctor’s with all my questions answered and my fears allayed, I felt weightless walking to the car. I stood erect.. feeling tall and with a lightness of step I hadn’t felt in years (tears roll as I relive these feelings). It was only then that my daughter disclosed that the surgery would take place in California! Wise woman… for she knew by that time that I would travel to earth’s end to have this procedure done by these two brilliant, caring doctors. Their knowledge, experience and expertise in their field was that evident. Having submitted the MRI and other relevant tests approving surgery, we were warmly welcomed by the OHNI staff the day before surgery. Although Dr. Osborne was concerned with the acceleration of growth of the tumor since our September meeting, he carefully assured me that this challenge would be met. I later learned that it was back to the drawing board for he and Dr. Hamilton well into the night. My anesthesiologist, Laurie, was truly the consummate professional I came to know her to be from our previous phone consults, in which she advised and guided me toward optimizing my health in the months leading to surgery. Her diligent face-to-face and text updates to my concerned family throughout the procedure were so comforting and much appreciated by them. Everyone connected with my surgery from pre to post-op went to great lengths to nurture me. I couldn’t have had a better experience if I were attended by family. I continue to marvel at the fact that I was so calm during prep, and that was no accident. For all displayed confidence that this was to be a life changing day for me, and the vibes I received were that they truly appreciated their role in it. Remarkably, after an 11 hour procedure to remove a 7 pound approximate weight tumor, I experienced no pain whatsoever. That first night, to quell the worry of family who insisted I’d need it, I reluctantly took one prescribed painkiller. That very next day we had lunch out after a tour of the market. I felt great! In the following days I had bruising and swelling of my face that subsided within the week, but no discomfort. On the third day post surgery, following the removal of the drain, the entire staff gathered in that little room for a look at the new me. They were so happy for me. From there, with my energy level very high, went spent the day sightseeing. Upon my arrival in NJ, family members were elated by my new look. I had snipped off my long hair to above shoulder length and my scar was the only giveaway to a surgical procedure. It is since barely visible and considering what it replaced, I wear it as a badge of honor. I am aware that initially Dr.’s Osborne and Hamilton had to be astonished by the size and scope of my tumor. Though they didn’t let on, I’m certain they had not encountered a growth of its magnitude before. Adding to the challenge, they were dealing with a 70 year old patient. Yet, in spite of risking a stellar surgical reputation up to that point, they were eager to have the opportunity to put an end to the painfully emotional and physical roller coaster I endured all those years. I cannot state the degree to which these men and all at OHNI went to alleviate my suffering. It went beyond the norm of any medical experience I had in the past. Nothing I’ve written above seems to me to give justice to the entirety of my experience. I’ve discarded many, many drafts of my account trying to do so. Put simply, words cannot not express my deep affection and appreciation to those of you, named and unnamed, who have changed the course of my day to day existence. It’s just so profound. I, my family and friends, thank you. "Had I known how wonderful these two surgeons were, I would have been here sooner. My surgery was better than I could have ever dreamed. I’m still having a hard time realizing the smile on my face is real." 8.5 x 7.0 x 5.0 cm partial parotidectomy specimen. Dr. Osborne and Dr. Hamilton were truly an answer to my prayers. I have seen many surgeons over the last 8 years. 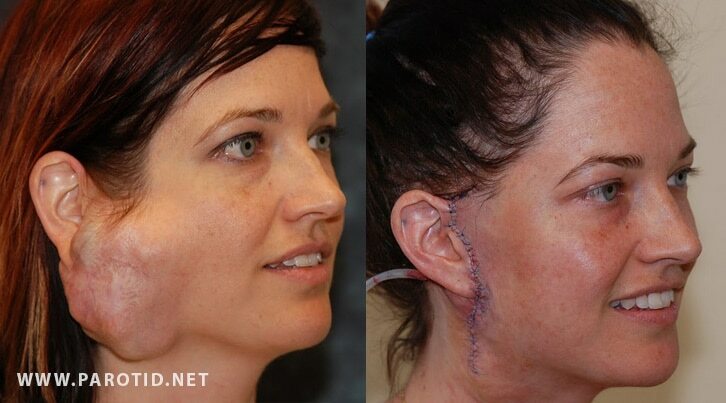 Even though a parotid tumor isn’t the end of the world, the standard surgery seemed to be close. I had talked to surgeons and patients alike. None of whom gave me a very promising outcome. I searched online and found the website. I looked several times before I finally set up a consult. Had I known how wonderful these two surgeons were, I would have been here sooner. They made no promises, but they let me know they would do everything humanly possible… And they did. My surgery was better than I could have ever dreamed. I’m still having a hard time realizing the smile on my face is real. They may have only done what was humanly possible, but I believe God blessed them with skills beyond most men. They also have a wonderful energy that is carried throughout the entire office staff. Thank you.